As the Baby Boomer generation moves into its 60s, more and more of us are concerned with looking younger. We do it with vitamins, diet, exercise, makeup, cosmetic surgery, and yes, even with cosmetic dentistry. In recent years we have learned a lot about how aging affects the soft tissues and bones of your face. This has led to an approach to orthodontics that considers not only the teeth and jaws, but also the continuing growth of the bones and soft tissues of the face. We used to think that growth stopped when people reached their late teens or early 20s. However, recent studies have shown that some kinds of growth continue throughout a person's lifetime. Your bones and facial structures change as much between the ages of 25 and 42 as they do between 18 and 25. As you age your facial profile flattens, your nose becomes more prominent, the lower part of your face becomes shorter, and your lips become thinner. By studying these changes we have learned to consider them when planning orthodontic treatment. Modern orthodontics treats the entire face, not just the teeth. The science of orthodontics is dedicated to slowly moving the teeth within the jaws to better functional and aesthetic positions, using standard braces or clear aligners. Sometimes the upper and lower jaws are so far out of alignment that more extreme treatment is needed. In such cases orthognathic (from ortho, meaning straight and gnathos, meaning jaw) surgery may be required to achieve the best results. Orthognathic surgery was once considered a drastic procedure, but it has become easier to manage during and following surgery and is now considered a more normal treatment option, like a facelift. Since the nose becomes more prominent as part of the aging process, the surgery is sometimes combined with rhinoplasty, or reshaping of the nose. This new approach to orthodontics and cosmetic dentistry — taking into consideration the normal changes that occur as a person's face ages throughout life — requires teamwork among a general dentist, an orthodontist, and an oral surgeon. The results are a long-lasting change that holds back the clock on aging. For decades, dental x-rays have helped us accurately diagnose and treat a wide array of dental diseases and conditions. But even with recent advances in digital imaging, the traditional x-ray does have one drawback: its two-dimensional view doesn’t always provide the “big picture” that a three-dimensional viewpoint can provide. But a new type of x-ray technology can do just that: known as cone beam computed tomography (CBCT), these machines record hundreds of digital images as a cone-shaped beam of x-ray energy is projected through a device that rotates around a person’s head. A computer then assembles the images into a single three-dimensional image that can be manipulated on screen to view from various angles. Not only does this provide greater context and detail, it does so with no more radiation exposure than a standard 20-film digital full-mouth x-ray series. 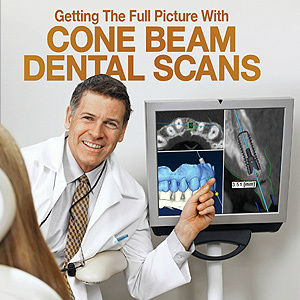 While CBCT hasn’t replaced the traditional x-ray, it’s making its mark in a number of specialized areas of dentistry. The following are just a few of the ways CBCT is improving both accuracy and treatment outcomes. Orthodontics. CBCT can provide a much more detailed view of the entire jaw; this can help us determine the best locations for realigning teeth safely and effectively. Dental Implants. With a CBCT scan we can precisely locate nerve canals, sinuses and adjacent teeth before implant surgery to locate the best position for the implant. TMD Treatment. To help develop the best treatment approach for alleviating the pain and dysfunction of temporo-mandibular joint disease (TMD), a CBCT scan can provide us detailed information on how the disease is affecting a patient’s joints, teeth, sinuses and airway. Impactions. An impacted tooth can exert damaging pressure against the roots of neighboring teeth. A CBCT scan allows us to observe the impacted tooth from various vantage points to determine the best treatment approach for neighboring teeth, nerve canals and sinuses. The World Health Organization found that about 60-90 percent of school-age children and almost 100 percent of adults have cavities. The only way to effectively treat a cavity is to remove the decaying parts of the tooth and fill it with a tooth-colored resin to protect the tooth from further damage or infection. However, if the sound of the dental drill instantly causes anxiety, you may find yourself cancelling your appointment out of fear. 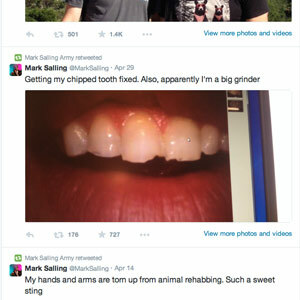 Now there is a way to fill your cavities without ever having to experience that drill ever again. With laser dentistry in Houston, we can now offer our patients WaterLase. WaterLase uses water, air and even a specialized laser to safely and effectively cut through your tooth’s enamel. It can be used in several dental procedures but is most often used to treat cavities. What are the advantages of using WaterLase? Besides removing the drill from the equation, WaterLase promises almost no discomfort during your procedure. The laser alone allows your dentist to properly treat the cavity with minimal and sometimes no anesthesia. Plus, the WaterLase is constantly spraying water to prevent the tooth from heating up, meaning that your procedure should be virtually painless. Another major advantage of the WaterLase is that is more precise than the drill. The dental drill can only remove large parts of the tooth, which can cause the patient pain; however, the laser technology of the WaterLase is so precise that it can remove the smallest parts of the damaged tooth without causing further damage or discomfort to the patient. Call Today's Dental in Houston, TX! So the next time you have a cavity, don’t fear your upcoming procedure. Ask us about using WaterLase for your next filling and enjoy an easy, stress-free and painless dental experience. Also be sure to mention if you have dental anxiety so we can do our best to put your mind at ease through the entire procedure. Call us today if you suspect you have a cavity, or if you need to schedule your next dental appointment. Forget about your drill anxiety. With WaterLase, drills are now a thing of the past! Are you a patient of Today's Dental? If so, we would love to hear about your experiences below!